You are invited to participate in a Christmas Tree Decorating Contest at the ​Salem Holiday Market… with a charitable twist! Local businesses, religious organizations, non-profit organizations, service clubs and individuals/families are encouraged to apply! ​We have up to 20 trees… join the fun! The event is limited to 1 entry per group. The submission of completed Official Entry Form is required (see button above), no later than December 3, 2018 by 4:30 pm. Incomplete or illegible entry forms will not be accepted. You must provide all decorations for your tree. You are free to express your creativity and originality, but we ask that your tree represent your business, organization or family and be in good taste, suitable for display at a family event. Decorations should hang on the tree, not sit alongside the tree or be held up by any means other than the tree itself. The Holiday Market reserves the right to remove any decorations not meeting this criterion. Any decorations can be used as long as they do not include electric parts. No lights may be used in tree decoration. (By order of the Fire Marshall). 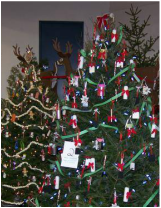 We will provide a sign, approximately 12” X 14” identifying the group or organization who decorated the tree. This sign will be suspended from the stand in front of the decorated tree. Donated trees and decorations will be raffled to staff and vendors as a “thank you”. Trees will be available for decoration on Thursday, December 6th from 2 pm until 8 pm or Friday, December 7th from 10 am to 3 pm. All participants MUST decorate their tree within the given time frame. If assistance is needed, please see a staff member at the Columbia Hall Information Booth. All Trees will remain on display through the end of the Holiday Market on Sunday, December 9, 2018 at 4:00 p.m. The public is invited to cast their vote for Best of Show from December 7th, 8th & 9th. Cash prizes of $150 will be awarded to People’s Choice, $100 to 2nd runner up and $50 to 3rd runner up. Each entry will be judged against all other entries and will be placed depending on the number of votes received. Votes may be cast by all customers and vendors attending the Holiday Market, except for members of the Holiday Market Committee and the Salem Saturday Market Board. Prizes will be announced at the conclusion of the Holiday Market on Sunday. Winners will also be notified by phone, text or e-mail. Winners, participants and/or images from the contest may be posted on the Salem Saturday Market website or otherwise used in publicity or promotional materials concerning the Holiday Market Celebration.